For someone who studies new media tech, weeks like this past one are essentially Christmas. I’m of course talking about the viral phenomenon that is the new Pokemon GO app. If my blog is somehow the first thing you’re reading after spending the last two weeks under a rock or completely cut off from civilization, and you have heard nothing about the game, Pokémon Go is a new app that allows users to navigate the physical world catching virtual pokémon, which are little monsters made popular in Nintendo and card games over the last twenty years. You then take your virtual pokémon to virtual “gyms” where you can fight other people’s pokémon. The game is unique because it takes advantage of augmented reality; the virtual world of the game is applied to real world locations, forcing players to walk around their neighborhoods and communities searching for pokémon, collecting supplies, and battling in gyms that are tied to businesses and landmarks. While certainly not the first augmented reality game — the game’s creator Niantic pioneered the concept with their Ingress game several years ago — Pokémon GO has certainly fast-forwarded the adoption of augmented reality gaming by the general public. In fact, usage of the app has already surpassed the usage of Twitter, Facebook, and Tinder, which is astounding considering the app has been in wide circulation for just a little over a week. It’s the diffusion of an innovation on steroids. Media research suggests that the widespread adoption of a new technology tends to happen very rapidly after it has been slowly adopted by innovators. There’s a tipping point when the tech moves from early adopters to the general public very quickly; however, the speed at which this game is bringing augmented reality to the general public is insane. It may be unprecedented. I think the answer to why this is happening is a combination of the source material’s continued popularity, the game’s concept perfectly matching the source material’s established concept while applying it in a fresh way, and good old fashioned viral social contagion. It’s a perfect storm. Of course, the dangers of playing the game are already being enthusiastically reported, such as the girl who was hit by a car while playing the game, or the two California men who fell off a cliff while hunting pokémon. I’ve also seen the inevitable “pokémon is going to ruin society” posts on my social media feeds. This is predictable. New media is always scary. The same fears about the downfall of social interaction and the inevitable collapse of civilization have been expressed about social media, the internet, television, telephones, the printing press, etc. etc. ad naseum. It’s important to understand that while a new medium may change the way we interact with each other, it doesn’t herald the end of social interaction; it’s changing social norms more than changing social connection. Yeah, there are bad things, but there’s also a lot of good things. For example, an Arkansas art museum is encouraging people to visit by enticing them with all the available Pokémon inside the museum. A Texas SPCA is encouraging people to come chase Pokémon while walking shelter dogs. 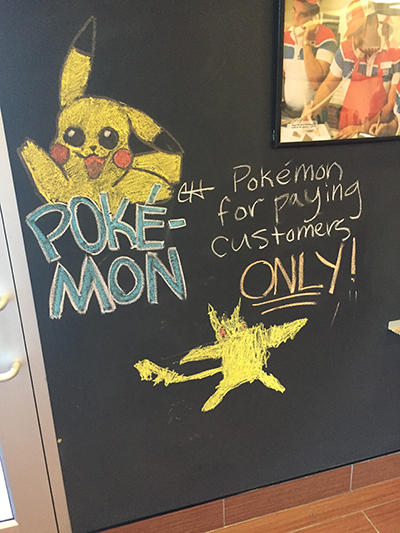 Business owners are already using promotions and in-game “lures” to attract traffic to areas near their businesses. In fact, game developer Niantic has plans to allow business to purchase sponsorships to lure players to their locations. This past week, my wife and I decided to go on a pokémon hunt around our neighborhood. With the baby in her stroller and the dog on his leash, we found our way to a couple of pokéstops located outside a little restaurant hub a few blocks away. Of course, our favorite food truck happens to be there, so we ordered a meal and sat down to catch some Zubats and Eevees while we waited for our food. The owner of the food truck saw us playing and came out to show us his pokémon collection. The next thing I know, the owner, his wife, and my wife take off chasing a Bulbasaur. It was a fun excursion. We left feeling even more loyal to our favorite food truck, which got some unplanned business because we decided to chase pokémon. I talked with the owner about how he could leverage in-game lures and discounts to attract customers. All that to say, any app that gets people outside exploring local landmarks and businesses is good for the community. Yes, be careful. Yes, watch where you’re going. Yes, look up and enjoy your surroundings every so often. But take advantage of the opportunity to form new social connections and find new things in your community. Personally, I can’t wait to see what app developers do with future augmented reality offerings, now that it’s something we all enjoy doing. This entry was posted in Communication, Marketing and PR, Technology and tagged augmented reality, diffusion, innovation, media, Niantic, pokemon, pokemon go, social media, technology. Bookmark the permalink. Great post! I’ll be adding this post to my small collection of fun and accessible blogs for Unit 5 of my literature course. Unit 5 is about exploring emerging literature–a concept I enjoy as I do not believe I have fully embraced the possibilities of technology and literature. Hope you get some new readers from the exposure. Thanks for posting and thank you for sharing!